"US Criminal Justice Policy and Practice in the Twenty‐First Century: Toward the End of Mass Incarceration?" How about a few clemency grants, Prez Trump, to really honor vets in need on Veterans Day? My question involves estate proceedings in the state of: CA For retirement accounts, lets say you designate 50% to a person. Lets call him John. Lets say you designate the other 50% to a trust. If you select per stripes if John dies, then his 50% goes to his children. But if you do NOT select per stripes what happens if John dies? Does his 50% automatically go to the trust making it 100%? I finally renewed my passport. "I’m boycotting the recount stories. They make me feel terrible and there’s nothing my watching them can do to help." The Supreme Court will release orders from the November 9 conference on Tuesday at 9:30 a.m.; John Elwood’s Relist Watch compiles the petitions that were relisted for this conference. On Friday, the justices will meet for their November 16 conference. The calendar for the December sitting, which will begin on Monday, November 26, is available on the Supreme Court’s website. 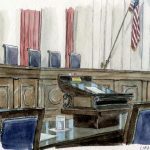 The post This week at the court appeared first on SCOTUSblog. Sanction Increased For "Sexually-Based Misconduct"
"We were going to be cremated when we die, but I thought, this is it, I’m going to be cremated right now. This is when I die." "Scotty’s been scorched by this firestorm, and just like a bratwurst, he’s fried!" "What I was surprised to find was the extent to which [the 'manosphere' is] using ancient Greek and Roman figures and texts to prop up an ideal of white masculinity."